For once I was the first one into the breakfast room, keen to avoid yesterday’s lateness. Breakfast choices were few but toast and corn flakes will do. We have a 7 hour drive today crossing into Thailand after about 2 hours. Near the border I tried to rid myself on my few remaining Malaysian Ringgits giving them away only to realise I needed to pay 2 MYR to get out of the country. Kirsty still had 2 left so the problem was quickly solved and I could continue on the tour. It is always interesting crossing the border as we all very much aware to the penalties for getting caught with drugs. Something you should always consider and make sure no one can access your bags. We eventually cleared both countries customs / immigrations without too much concern. For la d border crossings you get 15 days inside Thailand only which isn’t a problem for me. Our lunch stop saw us change vans for the second part of the trip and in my case a visit to the ATM for local currency the baht which is currently 31 baht to the Aussie dollar so 5,500 baht withdrawn (around $180 AUD). Hopefully enough for the rest of the trip, probably not. Just short of our hotel in Nakhon Si Thammarat we stopped at a major Buddhist Temple and Cat explained the significance of the temple and the brief system in particular the punishments, not keeping your parents happy is a major one based on the punishment you receive! We had a quick 30 minute turn around at our hotel in order to visit the Shadow puppets. I even had a shower in that time because despite being in a van for most of the day I felt dirty, not sure why. 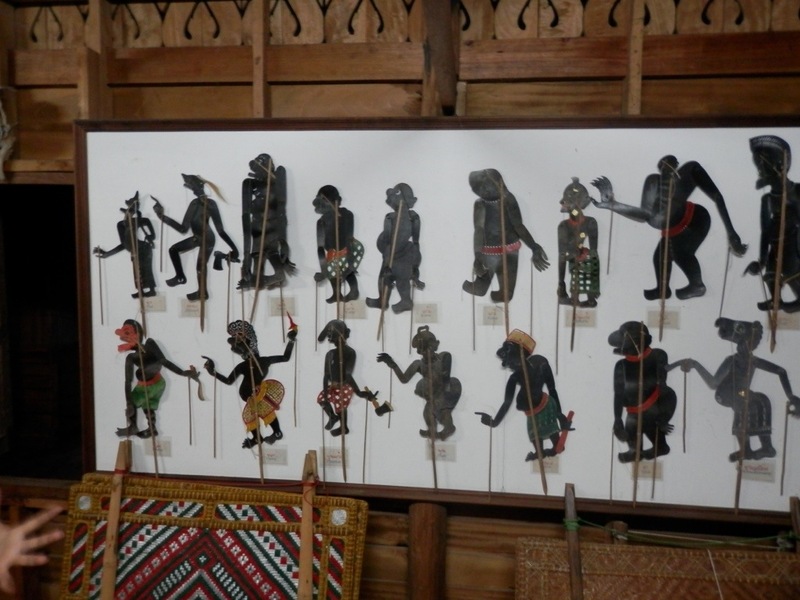 The visit to the Shadow Puppet Museum (in effect the Master’s house) was very enjoyable. While at one point this art form was practised everywhere today it is just in Southern Thailand. We got to see puppets over 150 years old. The performance was fun and enjoyable. They used a traditional story and added on some modern elements in the second half like mobile phones and motorcycles. Was very tempted to buy some hand made gifts but was concerned they wouldn’t survive the world trip. We finish having dinner at a restaurant near the hotel. My meal cost 100 baht (including 15 tip) which is around $3.20 AUD. Very cheap for chicken noodle soup and a drink. Another travel day tomorrow awaits including a ferry and then we settle for a few days. This entry was posted in World Trip 2012 and tagged Malaysia, SouthEastAsia, Thailand. Bookmark the permalink.